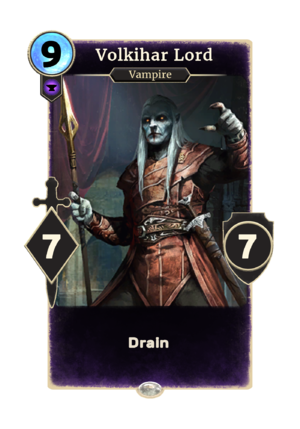 Volkihar Lord is a legendary Endurance creature card. "The first kill is always the sweetest." "I hunger for the taste of your blood." "Your death will be sweet!" "I feast on your pain!" This card was previously part of the training mechanic where it could be upgraded into either Blood Magic Lord or Night Talon Lord at level 50. The card is named for the Volkihar Clan of Vampires, which first appeared in Skyrim. This page was last modified on 16 February 2019, at 16:27.